Why would you want to be a US board certified Interventional Radiologist? To obtain certified and specialty training in Interventional Radiology. To achieve higher academic success. To widen spectrum of experiences. To increase income potential and job opportunities. What are the chances for an IMG (international medical graduate)? 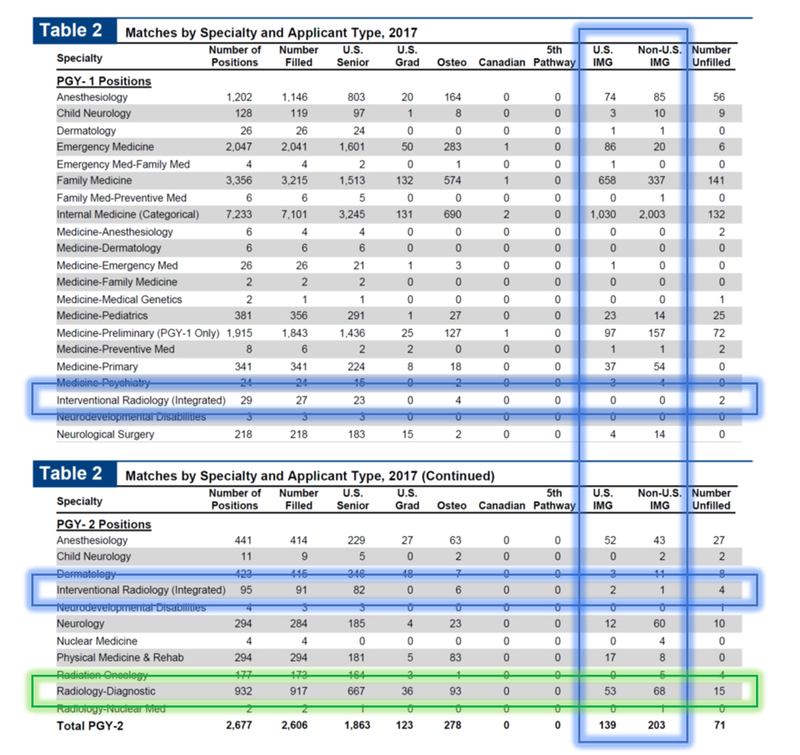 As you can see from the above numbers, matching directly into an integrated DR/IR residency (blue box) is not easy for IMGs (US citizens and not). In 2017, 0 of 29 (0%) PGY-1 and 3 of 95 (3%) PGY-2 positions were filled by IMGs. Due to increased popularity amongst American medical students, the new DR/IR integrated pathway has become quite competitive, one of the most competitive for the 2018 Match. Acknowledging this fact, a feasible alternative would be to apply and match into a PGY-2 Diagnostic Radiology position with an ESIR program, and then continue training into the new 1 year residency (“ex-fellowship”). 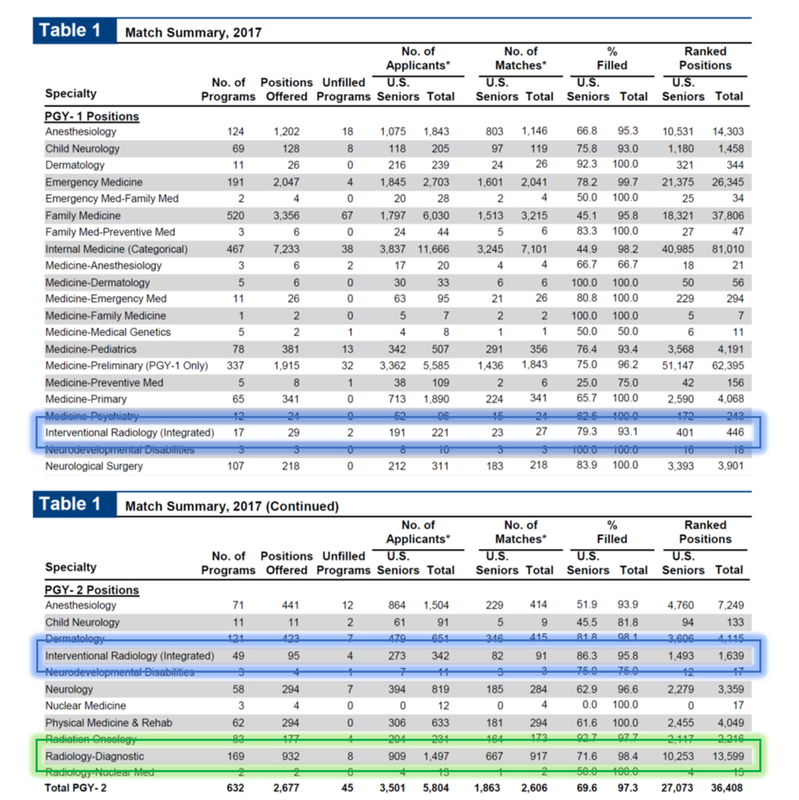 121 of 932 Diagnostic Radiology positions (13% of available positions) were filled by IMGs in 2017. Additionally, 15 positions were not filled via the Match and were made available via SOAP (see dedicated chapter for further details). As IMGs that have successfully matched into DR positions and/or are applying or have matched into IR fellowships, we believe that prospective IMG applicants should definitely apply BROADLY for BOTH DR and integrated DR/IR programs to increase your chances. The new DR/IR program is a competitive specialty: the probability of a non-allopathic graduate of matching into primary care specialties (e.g. Internal Medicine, Family Medicine) is nearly 2-4 times the probability of matching in Radiology. BUT Don’t let this divert you from chasing your dream. If you are truly passionate about IR, you may just have to make changes in your strategy and put in more work on building your credentials. Reading this thread is a great start and will hopefully be a good asset in your pursuit. What makes a competitive IMG IR applicant? We will focus on Non-U.S. IMGs. 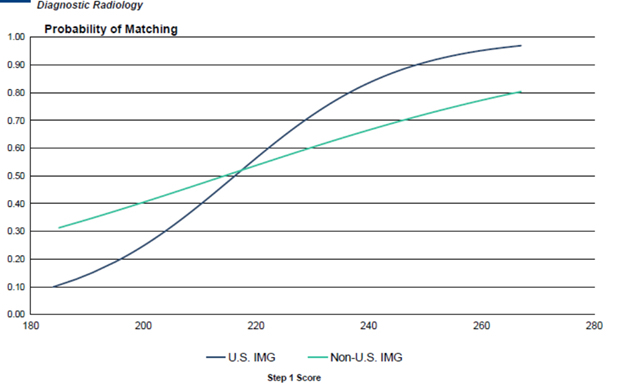 Based on the above presented data, the most consistent factors to increase chances of matching as an IMG are high USMLE Scores (Step 1> Step 2 CK) and research. Of note, the only advantage that U.S. IMGs have over Non-U.S. IMGs is that they can apply to programs that do not sponsor Visas, hence increasing their application pool. The Step 1 score is of particular importance and its value is directly correlated with the chance of matching. This is seen in the graph below regarding the probability of matching into Diagnostic Radiology in 2016 based on USMLE Step 1 score. A Non-U.S. IMG applicant with a score greater than 220 (approximately), had slightly more than 50% chances of matching. The second most important topic to discuss for a successful application is research. While NRMP does not specify what “research experiences” actually means, but we may assume that this corresponds to research electives or even entire semesters, maybe laboratory/bench research experiences. Matched and non-matched IMGs had 2.6 and 3.0 experiences, respectively; one can ultimately take away that research experiences are not a deciding factor in the selection process (generally speaking). What is important to notice, instead, is the significantly greater amount that matched IMGs had in terms of abstracts, presentations and publications compared to non-matched IMGs: 14.2 versus 8.3, respectively. While 14 research projects is an incredible amount for the matched group, 8 research projects that have been brought to completion is not a small feat either, and not easily reached without dedication and hard work. This testifies how important research is for matching, only second to Step 1 score. Work and volunteer experiences, additional degrees were not too different between the two groups. Planning as early as possible may make your journey appear to be more strenuous but you will reach better outcomes in a shorter amount of time. Late June-July 1st: Beginning of Residency. In other words, to start residency in July 2020, you should submit your full application through ERAS in September 2019. Briefly, ERAS (Electronic Residency Application Service) is the online system /portal through which applicants submit their application to programs. Interested programs will then reach out through ERAS to invite the candidate for an interview (see “The Match” section for more details). Rank list submission is done through another system, the NMRP. ECFMG certification: discussed in details in the ECFMG section. In short, requirements include medical school diploma, successful completion of USMLE Steps 1, 2CK and 2CS. Step 3 can be completed during internship. Theoretically, the actual deadline to complete your ECFMG certificate is Late February but, in reality, your chances of getting interviews are way higher if have your certificate ready by September and submit as soon as ERAS opens (usually mid September). Three Letters of recommendation: Preferably from US faculty members that you have worked with during your clinical rotations, research projects or observerships. Unfortunately, letters from back home will only be helpful if your faculty happens to be a world authority on a particular subject in the field you are applying to. Clinical rotations/observerships in the US (if possible). How to do it? What to do first? USMLE STEPS: Never rush your USMLE exams. Anyone can pass, but only high scores stand out. Stellar scores bring you more interviews, open more doors and get you in the system more easily. Scoring low on your Steps is not the end of the world, but it will require you to make extra effort to compensate. Take your time to study, do as many question banks as you can, and do not walk into an exam unless you have taken multiple sample tests and are happy with the estimates. Try to give the Steps in your home country, it will make it easier to study as you’re generally more economically comfortable and have less things to worry about. ROTATIONS/CLERKSHIPS/OBSERVERSHIPS: Important as a trainee and an applicant. The goal of US based rotations is to network and to obtain letters of recommendation - you will need 3 in order to apply for the matching process. All the IMGs whom have contributed to this guide agree that networking is, probably, the most important factor in your application. You can have a high Step 1 score and somebody might notice that among the other hundreds of applications that they are reviewing, but knowing somebody who will just point out your applications goes a long way. How to do this? Network at conferences and meetings with residents and attendings, become involved with the SIR Resident and Fellow section and/or send emails to program directors or attendings at a program you are interested in and simply ask. Keep in mind that having experience in Interventional Radiology from your country of origin will only help. Hence, plan your foreign rotations early. You may need to do that 6 months in advance in order to organize everything. Try to do a number of rotations (not observerships) before you graduate medical school. This way you’ll be able to secure hands-on experience clinical electives (which are tremendously more useful than observerships). Remember, during an observership you can only shadow and watch, nothing more. Additionally, it is easier to find an elective or observership as a student rather than a medical graduate/doctor. Aim for academic places. Remember to seek rotations/observerships also in your potential internship field (preferably general surgery, but also internal medicine) and not only in interventional radiology. It is your responsibility to secure a preliminary residency position in one of those specialities. Most (if not all) clinical electives (not observerships) require you to have USMLE Step 1 Score. Even if you find a program that does not require this, take at least one of the USMLE exams (step 1 preferably) and have the score back before starting. This will allow US attendings to have something to compare you to US students; foreign grading systems can be different from what US attendings are accustomed to and make it difficult for them to compare you to American medical students. Also, having completed one or more exams will unload some stress out and allow you to focus your attention on learning the US medical system, building good rapport with residents (and attendings) and focusing on research projects. RESEARCH: This is of the uttermost importance (see the previous section). Start early in medical school and try to focus on IR or diagnostic radiology. If you can’t find radiology related projects, any research is better than none. Preliminary 1 year position (internship): preferably in surgery, but can also be in medicine, surgery, or a transitional year. Otherwise, just for Categorical programs (in DR or DR/IR). Remember, advanced programs (as most of DR and DR/IR programs are) offer you a radiology residency without an internship (PGY-1) position. It is your responsibility to apply independently to a preliminary spot (in medicine, surgery or a transitional year). Your preliminary and advanced positions do not have to be in the same hospital. You may do your internship in south Texas near the Mexican border, and do your Radiology residency in Detroit near the Canadian border. However, you will not be able to go to your advanced Radiology position if you do not secure a preliminary position. You apply for both positions during the same match year but while your internship position will start in July of that year, your radiology position will start one year later (at the end of you internship). Try to not rely on the Post-Match SOAP (Supplemental Offer and Acceptance Program), also known as “The Scramble”. SOAP starts Monday of Match week (in March) until Thursday of that week and allows applicants who went completely or partially unmatched to apply to unfilled residency positions. At the same time, it allows unfilled residency programs to search for residents. Famously, many general surgery preliminary/internship positions are often available through SOAP. You can find further details in “The Match” section. Keep going to IR meetings during the matching season, keep adding to your CV and gently updating programs about your progress. Try to not have gaps in your application. For example: you finished medical school in 2012 and then you have nothing in your CV until 2015. Empty periods do not look good on your application. Try to remain active, doing research, writing abstract and manuscripts, volunteering within societies (US and foreign) and obtain additional certifications. Reach out to internal medicine or general surgery program directors even when you are rotating in Radiology. It will help you to make connections based on what kind of internship you plan on applying to. The most important thing you can do is getting people to know you and trying to not just be “another application”. During your journey on the match, you are certainly going to meet many professional, doctors and medical students. The program coordinators can be your best friend or worst enemy - always be kind. Keep in touch and establish good rapport with everybody. Your home school grades do not matter that much! Apply to as many programs as you can - don’t cut expenses on the application fee. Don’t shy away from applying to famous institutions even if you think that you don’t have a chance. You never know.